Beyond Breathing Problems And Hives: What Happens To Your Body When You Have An Allergic Reaction? A detailed overview about what allergies really are, what causes them, and what happens to your body when having an allergic reaction. In the US alone, almost a third of the adult population suffers from allergies. It is the 6th most common chronic disease that affects both adults and children alike. The immune system of a person who suffers from allergies means well: it’s looking to release chemicals that can eliminate allergens, to protect the body. Even so, few people know what are the exact processes happening inside the body of someone who suffers from allergies and, in some cases, this information could save someone’s life. Allergies are the body’s reaction to a substance that’s identified as being harmful. Certain people may develop a hypersensitivity to products that trigger allergies (which are also known as allergens). Because of this hypersensitivity, the body sees the allergen as a threat and starts “overreacting”. Blood cells, which are responsible for protecting the immune system, start creating antibodies to protect the system from this threat. As signals are sent throughout the cells, the body releases chemicals like serotonin or histamine, looking to block allergens. As a result, organ muscles constrict and, in turn, trigger the symptoms known as allergy reactions. There is a chain reaction happening inside the body of a person who’s reacting to allergens. This combination of body protection and chemicals that are being released causes different changes in the body. Anaphylaxis is an allergic reaction that could potentially trigger death. It affects several body parts, like the skin, heart, and airways. It is generally triggered by foods (such as nuts, eggs, milk, certain fruits, etc. ), but there are also some non-food causes (like certain fabrics, bee stings, or different types of medicine). In some cases, a person can go into anaphylactic shock, which is characterized by a major drop in blood pressure. Skin flushing, skin rashes, and itching and hives. A person can experience one or several of these symptoms either right away, or after a period of time. Uniphasic reactions are characterized by symptoms which are visible right as the shock begins. Once they are treated, the symptoms will not return. Biphasic reactions can start off as being mild or severe, but can fade in time, only to appear again. In such situations, the person who shows biphasic reactions must be hospitalized and observed, as the time frame between two reactions can be as long as 72 hours. 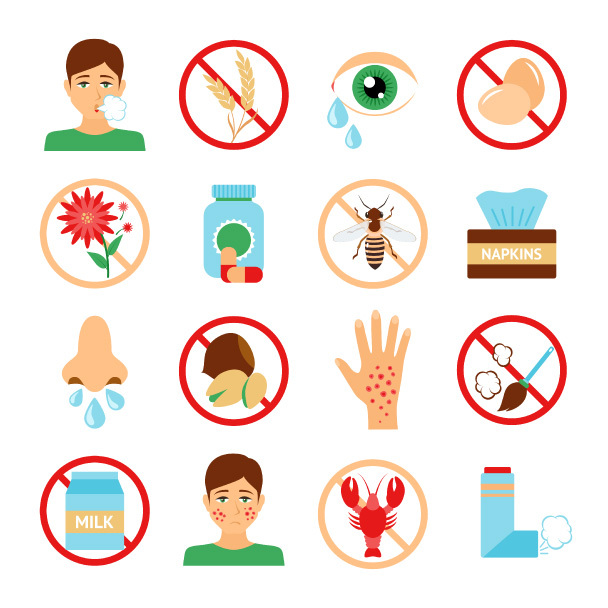 People who suffer from aeroallergen symptoms. Someone who suffers from allergies should always consult a doctor to get the proper diagnosis and treatment. Aside from asking a number of questions, the doctor can also perform a physical exam. Skin test implies exposing the patient to several proteins that are found in allergens, and check to see if the body has any reaction to them. The blood test measures how many allergy-causing antibodies are found in your bloodstream. A blood sample is taken and analyzed in a medical laboratory, to confirm or deny the doctor’s suspicions. Prior to visiting a doctor, one must be prepared to answer a series of questions related to their current lifestyle, details about their current living environment, or provide information about past treatments. Epinephrine is the immediate response to an anaphylactic shock. It’s sometimes referred to as an “adrenaline injection”, and works to counteract the body's reaction to anaphylaxis. Epinephrine acts as medication, a neurotransmitter, and a hormone that’s linked to the body’s fight-or-flight response. This is a psychological reaction triggered by the human survival instinct. It’s when the body released a massive quantity of hormones in preparation of confrontation or escape. The ideal scenario is to be aware of what causes the allergy in the first place and try to avoid the allergen. When a person suffers a shock, the heart may stop beating or there could be a shortness of breath. CPR is mandatory in such cases, together with adrenaline administration, oxygen, antihistamines, and cortisone, or a beta-agonist. If you are ever in the presence of a person suffering from an anaphylactic shock, the first step is to call 911. Immediately after, an epinephrine injection is required, but only when the person is lying down and that their legs are elevated. If the person isn’t capable of auto-injection, grab the pen and press into the person’s thigh. It’s important to check the person’s pulse and, if they’ve stopped breathing, to administer CPR until medical help arrives. People who are suspect of having allergic reactions to certain types of food should see a specialist who can give a correct diagnosis. Regardless of the trigger, one must always have emergency medication (like an EpiPen) at hand and administer the treatment as soon as the first symptoms of a shock become noticeable. Since there isn’t a permanent treatment for food allergies, prevention is key. In some instances, it’s useful to keep a food diary, in order to best identify what triggers an allergic reaction, and give the doctor as much information about it as possible. What Do You Need To Know About Metal Allergies? Think You Are Allergic To Cosmetics And Makeup? How common is Natural rubber latex allergy?